CARDIFF-BY-THE-SEA — San Diego imports more than 70 percent of its water. 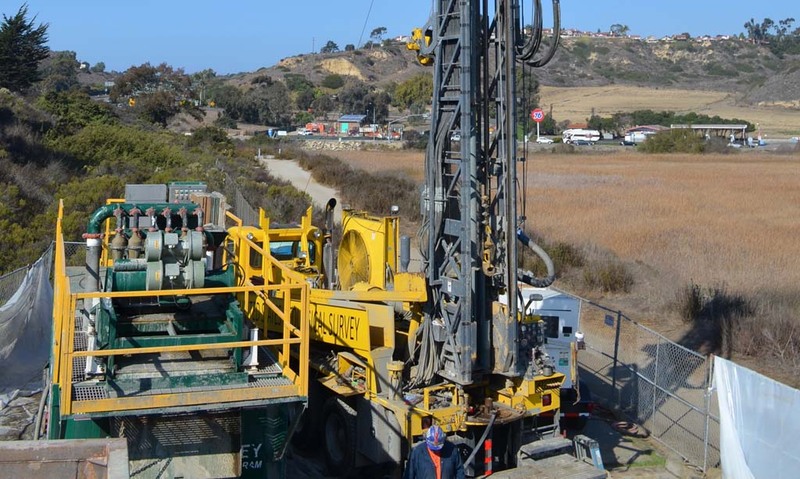 To help wean the region off of its reliance on outside water sources, scientists Monday directed a drill to plunge nearly 1,200 feet into the earth at the San Elijo Lagoon to determine the quality and quantity of water underground. Initial tests of the groundwater have been encouraging, showing considerably less salt than seawater. Because of this, the groundwater would be easier to treat, so it could cost less than other popular alternatives like ocean desalination. But a more accurate estimate won’t be known until more results come in over the weekend, according to Wesley Danskin, a research hydrologist with the U.S. Geological Survey (USGS). “What we know is that there’s likely to be a large aquifer there,” Danskin said while standing near the drill that’s been just southeast of Manchester Avenue since October. He noted that groundwater from San Diego sites could provide 10 percent of San Diego’s water demand in the future. “This isn’t a silver bullet, but another important straw to draw from,” Danskin said. Should the groundwater meet OMWD’s standards, a groundwater desalination facility could be constructed outside of the lagoon, several miles east, in 2018. Danskin said the current well is only for testing purposes and environment will be returned to its prior state once the project wraps up in the next week. Due to the scarcity of local water resources, USGS has been investigating San Diego locations potentially rich in groundwater since 2001. One of 12 projects in San Diego, the San Elijo Lagoon site is the first in North County. Historical records led researchers to the spot. Nearly a century ago, a company’s search for oil in the area yielded abundant groundwater instead. Another benefit of the area: If a groundwater desalination facility is built, researchers would need a way to dispose of salty brine extracted during the groundwater purification process. A nearby outfall could serve that purpose, saving money that would otherwise be required to build a pipeline, Danskin noted. Also, treating the groundwater through reverse osmosis wouldn’t require as much energy as ocean desalination. Seawater’s salinity is 33,000 parts per million, while groundwater at the well is 1,800, according to Joseph Randall, management analyst supervisor with OMWD. Kimberly Thorner, general manager of OMWD, agrees. The district partnered with USGS on the groundwater project as another possible way to diversify its water portfolio. Currently, groundwater is likely too expensive for the district. But with the price of imported water, most of which comes from the Colorado River, projected to increase during the next five years and beyond that, she said treating groundwater in 2018 would make financial sense, and environmental, too. Purifying groundwater is generally more eco-friendly than ocean desalination, she said. The $450,000 project has been funded by $300,000 in grants from the U.S. Bureau of Reclamation and the California Department of Water Resources, as well as $150,000 from OMWD and USGS. In addition to OMWD, the USGS has also worked with the San Elijo Lagoon Conservancy, the San Elijo Joint Powers Authority, the city of Encinitas and the city of Solana Beach, among others on the project. The facility would produce an estimated 1.5 million gallons of groundwater per day, making up as much as 10 percent of OMWD’s potable water. Taking recycled water and groundwater together, 30 percent of the district’s water need could come independently of imported wholesale water, according to OMWD’s website. Thorner said Chula Vista’s Sweetwater Authority, which began using groundwater about a decade ago, has been a model for other districts.